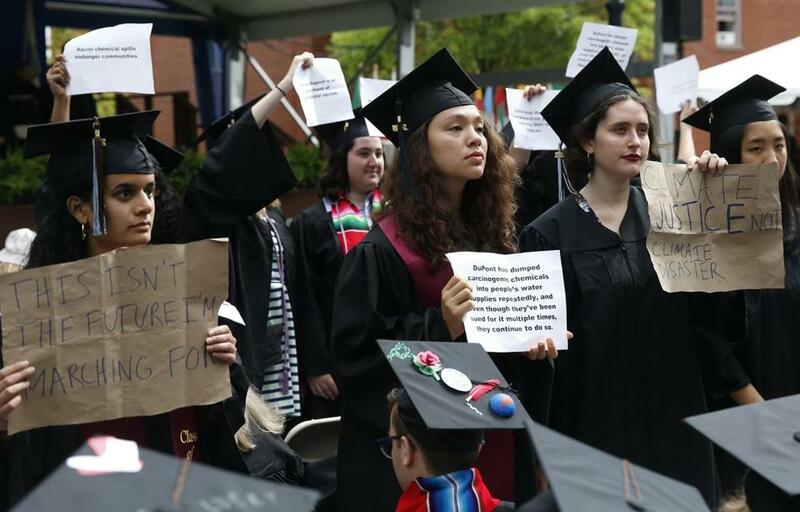 Some Tufts University students turned their backs in protest of commencement speaker Ellen J. Kullman. Many Tufts University graduates said they were baffled Sunday by commencement remarks on fairness and integrity by Ellen Kullman, former CEO of DuPont, which settled several cases related to chemical dumping in recent years. A group of about 150, out of 3,700 graduates, silently protested through Kullman’s remarks, turning their backs to the stage and holding up signs that accused the company of ethical impropriety. One sign mentioned a 2016 settlement in which the chemical giant DuPont, formally called E. I. du Pont de Nemours and Co., paid more than $50 million after decades of releasing toxic chemicals that ended up in the waterways of the Shenandoah Valley. As part of the deal, the company admitted no fault. Kullman had left the company in 2015. Students organized the protest several days before the commencement, after concerns about the university’s choice of Kullman as speaker had been growing for almost a month, according to several graduates. The university stood by its choice of speaker in an e-mailed statement to the Globe. Kullman never addressed the company’s environmental issues and instead challenged graduates to contemplate how future technologies could change societies and economies. Some students also said they were surprised that Kullman spoke very little about feminism or women in the workplace. The former CEO co-chairs Paradigm for Parity, a coalition of business leaders dedicated to addressing the gender pay gap. During her speech, Kullman made only a brief remark about equal opportunities for everyone in the workplace, including women. “I saw her on ‘60 Minutes’ talking about equal pay for women, but it was such a short portion of her speech,” said Charlie Peskin, 21, a graduating international relations student. “I’m surprised she didn’t say more. As part of the ceremony, an honorary doctor in science degree was awarded to Kullman, who received her bachelor’s in mechanical engineering from Tufts in 1978, She currently serves on the boards of directors for Goldman Sachs, United Technologies Corp., and Carbon. She also sits on the board of advisors for Tufts University’s engineering school. In her final remarks, she challenged graduates to be civilized in discourse and discouraged approaching every issue as a zero sum game. “You may be pressured to see things otherwise, to see every confrontation as a proverbial hill to die on,” said Kullman. “Resist those pressures as best you can, and in the long run, you’ll be happier, and I believe, successful in doing so. Jerome Campbell can be reached at jerome.campbell@globe.com. Follow him on Twitter @jeromercampbell.